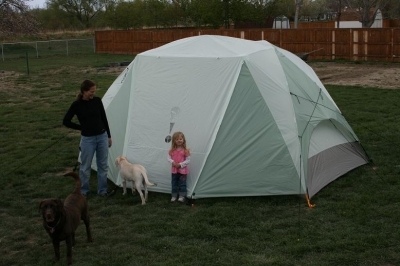 Montana Test.com - Results for: Eureka Suite V 6 Tent! Reviewed! 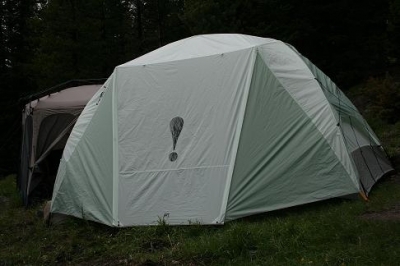 Ideal for People Over 6 ft Tall, this Unique 3-pole V-Shaped Dome Offers Maximum Height at Front of Tent for Easy Entry. The Suite V series' unique pole structure provides maximum headroom where you appreciate it most, at the front of the tent. Maximum height continues into the front vestibule for excellent livabilty. Unique 3-pole V-shaped dome offers spacious livability and maximum headroom in a small overall footprint. Top view of tent shown. Large multi-configurable vestibule permits use for storage or as an awning. HA, poles, used to create an awning, are sold separately. Side-opening, D-style doors with Hi/Low vents offer ease of access and great ventilation. Four storage pockets, 2 on the inside and 2 on the outside, keep essentials nearby. Freestanding fiberglass frame with clips, pole sleeves, and post and grommet assembly makes set up easy. Interior convenience features include a removable room divider curtain to create 2 separate rooms for privacy and a storage basket. The tent features a tensioned perimeter seam bathtub floor.